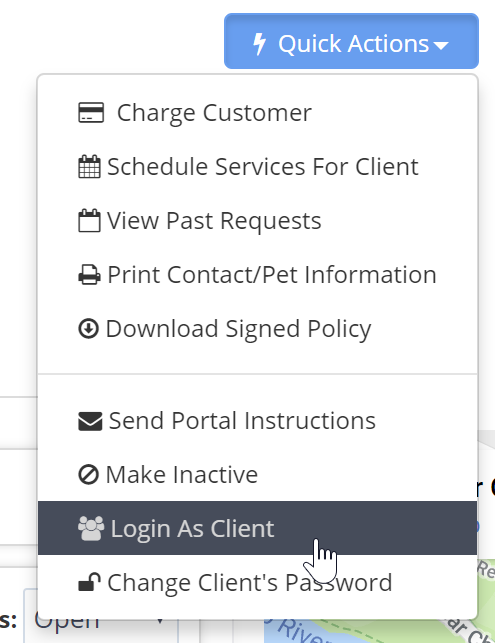 Every client in Time To Pet has access to a Client Portal. However, in some cases it may be helpful for the admin of the company to see exactly what your customer sees in their Client Portal. Time To Pet does support a "Login As Client" button that allows you to see your client's portal from their perspective. You can access the Login As Client tool from your Client's Profile by clicking the blue "Quick Actions" button. Time To Pet will ask you to confirm that you would like to login as your client. After clicking "Login As Client" - you will login to the Client's Portal just as if you were the customer. Keep in mind that Time To Pet will treat you as if you are the actual client. You can submit requests, send message and pay invoices just as your client would.